I was really curious to see what Bill Frisell would do after the monumental Quartet album, and Nashville was a wonderfully pleasant surprise. 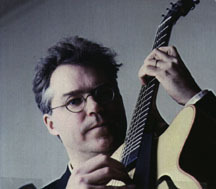 Frisell's penchant for country music comes to fruition in this easy going back porch meditation on bluegrass and folk music. The tracks echo of old love songs, hot and humid days, and the inevitability of a friendly smile or a handshake. Robin Holcomb guests on a few tracks, lending her exquisite voice to Neil Young's "One of These Days", "Will Jesus Wash The Bloodstains From Your Hands?" and "The End of The World." Also of note are the incredible Jerry Douglas on dobro and Ron Block on banjo and guitar. This album was the first time Viktor Krauss (brother of Allison Krauss) and Frisell played together, in fact by an accident of necessity; Frisell needed a bass player, and someone recomended Krauss, who he'd never heard of. Krauss solid low end keeps the album running, and his selfless and impeccable playing makes a good match with Frisell's guitar. This album is possibly the most accesible in the Frisell discography, and should appeal to anyone with a penchant for folk and bluegrass.